The £35m Aerospace Integration Research Centre (AIRC), which is set to change the way the world thinks about flight, has been officially opened at Cranfield University. Funded by Airbus, Rolls-Royce and Cranfield University, following an award from the Higher Education Funding Council for England (HEFCE), the Centre will be a flagship facility for boosting aerospace research capabilities in the UK, cementing the University’s reputation as the leading aerospace research institution in Europe. Researchers from both the University and business partners, including Airbus and Rolls-Royce, will work under one roof. The Centre will be researching ways of integrating advanced technologies to reduce the time from academic innovation to industrial application. 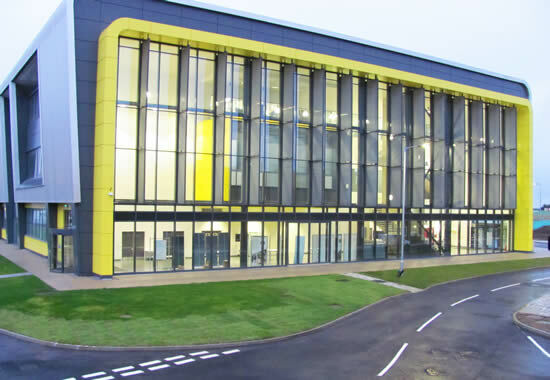 To enable this, the AIRC is equipped with the latest cutting-edge aerospace research technology including air traffic management (ATM) and unmanned aerial vehicle (UAV) laboratories; flight simulators; a virtual wind tunnel; a FANUC robot in the intelligent automation centre; and a 1500 sq m open space work area, currently housing a full-size wing from an Airbus plane. Henner Wapenhans, Director of Technology Strategy, Rolls-Royce, added: “We are delighted to be a lead partner with Airbus in the Aerospace Integration Research Centre, which will also strengthen the existing strategic partnership between Rolls-Royce and Cranfield University. Cranfield is the only university in Europe that brings together major aerospace research facilities such as the AIRC, an operational airport and runway on one connected site.